Brittany is a 2,000-kilometer-long coastline in western France surrounded by numerous frequented seaside resorts. On the biggest peninsula in France history is still alive. Already 5,000 BC people lived in the Brittany area and practiced agriculture and livestock farming. Today tourism is the most important source of income for the 3.2 million habitants. Cultural center of Brittany is the town of Rennes, founded by the Gauls. The old town around the Place des Lices with its narrow streets seems like a labyrinth. Numerous creperies are waiting to welcome you. A lot of visitors are travelling to Brittany to spend some relaxing days at the beaches of the emerald coast. 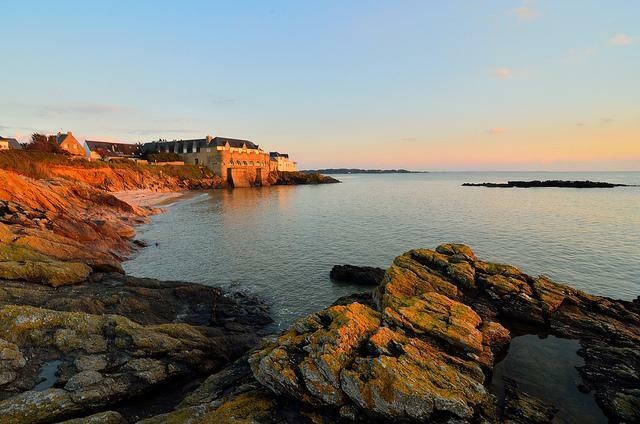 The towns of Dinard and St. Lunaire offer a range variety of leisure activities. Not far from La Baule you can find one the most beautiful bathing sites in France. The Côte de Granit with its red cliffs is one of Brittany’s landmarks. Do not miss the town of Quimper where you find the cathedral St. Corentin, the eldest Gothic church in France. Quimper has preserved its original historic charm. In the art museum visitors can glance at the Fayence-plates which are characteristic of the region. Brittany is also rich in megalith. More than 6,000 pieces of these treasures of the past have been found in the area. If you want to learn more about the stone formations, pay a visit to the pre-historic museum in Carnac. One of the most impressive places in Brittany has been created only by the wind. The Cap Fréhel, a steep cliff coast at the Atlantic, provides protection to thousands of breeding birds. From Pointe du Groin to Ile de Bréhat, 400 hectare of heathland light up the fields in violet colours. If you are very lucky you can discover a razorbill, a very rare penguin. You definitely should walk to Fort La Latte located in a picturesque setting on a cliff from where you have a stunning view of the emerald coast. The UNESCO World heritage site Mont Saint Michel is located directly at the English Channel in the north of Brittany. It is not without reason that the abbey Mont Saint Michel placed on the rock is one of the most popular sights in the region. It is assumed that the archangel Michael appeared to a bishop on the cliff, what made it an important pilgrim place. Beside the abbey you can stroll through the small alleys of the town or you can visit the museum and learn more about the history and the ecology of the island. Three million visitors per year cannot deceive! In the very west of Brittany you find the Cape Pointe du Raz. The coast provides protection to thousands of seabirds. From the observation deck that is accessible via a shuttle bus you have a stunning view of the Atlantic and the two lighthouses Phare de Tévennec and Phare de la Vieille. The area is very popular amongst surfers and you can spend hours watching them diving into the waves. A walk along the Pointe du Raz is a good way to discover the beautiful landscape in its full splendor. A very mystical place is the fairytale forest Brocéliande. In this wild forest you find the church of the Holy Grail and the tomb of the wizard Merlin. The forest is the location of the legendary King Arthur Saga. On maps the 7000-hectare-site is marked with the name Paimpont. In the castle Comper you get to know everything about the saga of King Arthur. Discover this legendary place during a stroll. Do not miss the Barenton-spring which is said to have magic power. 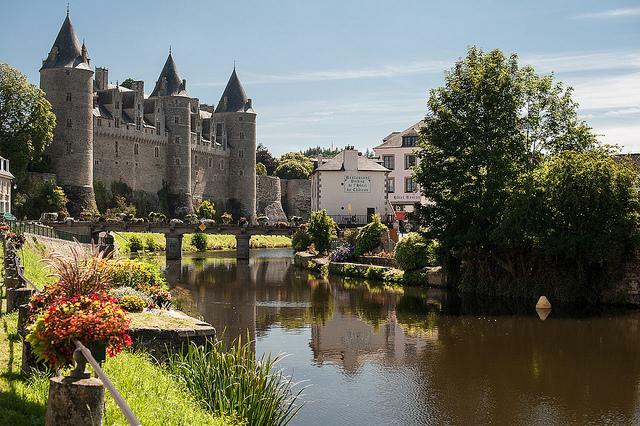 The Josselin castle rises majestically above the town of Josselin. With its three towers alongside the Oust river the castle is a very good example for the opulent architecture of the Renaissance. Still today the Rohan family lives in the ancient castle, built in the 11th century. Inside of the building you should take a look at the medieval dining room and the anteroom with numerous family portraits of the owners. The well-kept green garden invites you to have a relaxing walk. The Pink Granite Coast is located at the Côtes d’Armor around the seaside resort Ploumanac’h. The rock formation on the 25-hectare-large area between the beaches Trestraou and Saint-Guirec fascinates thousands of visitors every year. In 1907 the customs path has been opened to the public and is a great place for a romantic walk through beautiful landscape. The biggest stones are up to 20 meters and carry creative names like Napoleon-trident or love-arbour. At sunset the rocks are coloured in shiny orange. The heath surrounding the sophisticated seaside resort Carnac is speckled with more than 3000 of menhirs. On an area of over one kilometer the stones rise vertically out of the ground. People are still unsure where these strange stone formations were coming from. The only fact we know is that they were built 5000-3000 BC. The most impressive formations are the ones in Le Menec, Kerlescan and Kermario. Everyone who wants to learn more about the history of the menhirs should visit the pre-historic museum. The mystical atmosphere at this place will fascinate you.